Fortis Riders, a leading global chauffeured management service, is partnering with the security firm Tegumen. The partnership enables Fortis Riders, who already transports more private jet owners than any other chauffeured service worldwide, to enhance their security offerings. Chauffeured service is the most vulnerable part of a principal's travel. Think of travel security like a suit. A discerning global traveler needs a suit that fits him for every occasion. Fortis Riders, a leading global chauffeured management company, announced today that it is formally partnering with Tegumen to enhance its security offerings for elite private travel. Tegumen is widely recognized as a leading-edge purveyor of risk intelligence and protective security expertise for corporate leadership. Through the partnership, Fortis Riders is now able to offer intelligence services, executive protection, and an array of other security services. Chauffeured service is in fact the most vulnerable part of a principal’s global travel. As Gavin de Becker wrote in his book Just Two Seconds, 64% of attempted attacks take place in or around the principal’s vehicle. 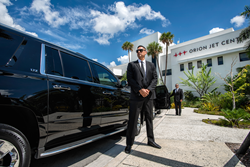 At the same time, standards for chauffeured travel are unregulated and globally inconsistent, and most clients do not know what security features to expect from a chauffeured service, or which ones are even possible. The Fortis Riders technology team is known for leading edge security products, most notably its patented secure communications platform that connects all involved parties to a ride. With Tegumen as its partner, Fortis Riders is developing next generation technology that will integrate intelligence, personnel, and client data to make custom security recommendations to clients as they book their travel. Founded in 2000, Fortis Riders picks up more private jet owners than any other chauffeured service in the world. With offices in Greenville, South Carolina and Hong Kong, Fortis Riders provides secure transportation with services including armored vehicles, executive protection, and advance reports. Using its own patented secure communication system, Fortis Riders provides real-time information to all parties on a ride—private pilot, passenger, scheduler, chauffeur, and executive assistant. Fortis Riders has been named to Inc. Magazine’s list of America’s fastest-growing companies eight years in a row. Tegumen, LLC was founded in 2015 by Filippo Marino, a 25-year veteran of public and private sector security services. Based in Miami, Tegumen provides Protective Security and Enterprise Risk Intelligence for Fortune 500 clients. Marino formerly led McDonald’s Global Risk Intelligence and Executive Protection operations. He has managed risk and security planning for some of the world's most recognized brands and during major events including the Olympic Games and FIFA World Cup.